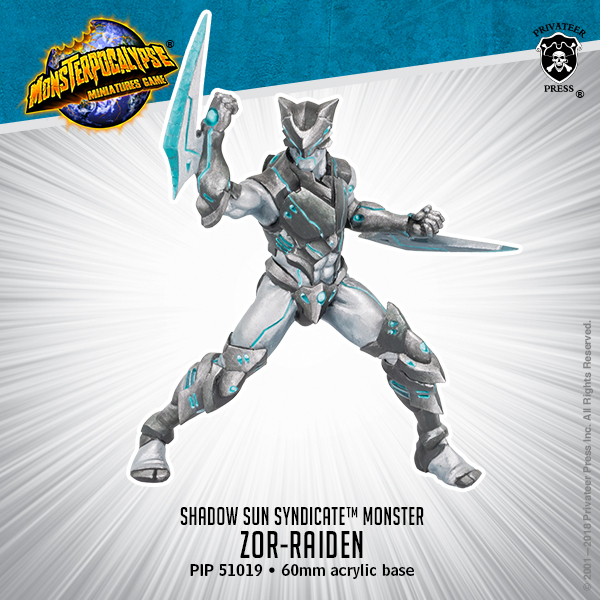 Biomorphic and cybernetic nanotechnology empowers each of the zors, the mightiest class of the Shadow Sun Syndicate’s living weapon-warriors. Each represents a highly skilled and augmented human wearing an armored suit capable of morphing them into fighters of sufficient size to stand toe-to-toe against Earth’s invaders, utilizing both martial arts and advanced energy weapons. The soldier forming the basis for Zor-Raiden was specifically recruited as one of the last surviving members of a nearly forgotten ninja clan hidden away in the northeastern mountains. Considered brash and headstrong by ranking members of the Syndicate, Raiden is nonetheless extremely skilled in combat and has demonstrated uncanny unspoken coordination with other shinobi units.